Buddy is a nice guy, and we know he wouldn’t bother our horses. He probably wouldn’t feed them anything, either, and if he did I’m sure it would be something safe, like a carrot. But on the other side of the pasture are the neighbors my dad affectionately calls “The Bumpuses” (yep, another “A Christmas Story” reference). They do not have a bunch of hounds – just the two – but they do have three, ahem, rowdy children. They also share a fence with us, and apparently said children routinely played in our pasture when the previous owner lived here – whether they had permission or not is kinda unclear. In any event, they’ve caused us worry ever since we brought our horses into the pasture. Some concerns are horse-related, some are not. 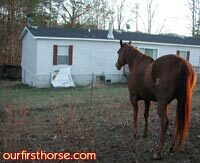 Since this is a horse site, let’s talk about the horse-related concerns that neighbors can bring. Horses damaging neighbors’ property. What if our horses decide Buddy’s garden is just too irresistible? I think you have to ensure your horses are contained as well as you possibly can, to keep the neighbors happy. And the horses safe, of course. Neighbors feeding your horses. For the most part, I think people have common sense about what you can and can’t feed horses. But there are some things you can feed a horse that seem pretty safe that really aren’t. Some plants, for instance. It’s entirely too easy for your horse to be fed something bad without you even knowing. Landscaping. This is even touchier. We want to block our view of the Bumpuses’ mobile home. This in turn will block their view (of our pasture). I think we have every right to plant some privacy-ensuring trees or hedges, but I’m sure they won’t be happy. Liability issues. I remember being a kid. I remember being around boy children. I knew a great many kids, particularly boys, who would not have been able to resist the urge to ride a horse that lived practically in his backyard, as my horses do. I can tell you that neither of our horses would take kindly to that. Or a child could get stepped on, or kicked, or bitten. Most of all, I don’t want anything like that to happen to anyone, but also I really, really don’t want to be sued by a neighbor for something I tried to prevent. So the point here is that, in addition to the many other responsibilities horse ownership brings, there is the added burden of trying to be a good neighbor. We do what we can…but I’m pretty sure the Bumpuses don’t like us. Who Was That (Fly) Masked Horse? That is a beautiful horse so very white!!! Looks very friendly too. Many thanks for thinking of me with the awards I really appreciate it.And thanks also for your comments on the picasa problem I am having. Picasa is the program that is causing the problems and are looking for payment to have a larger memory. I will need to look into it a wee bit more and find a solution. Thanks for your comments I really appreciate your help. )Have a great week.